We spent four nights in the Lake District in August and had a fantastic time: driving up on the Thursday and coming back on the Bank Holiday Monday gave us three full days, and we had really good weather. 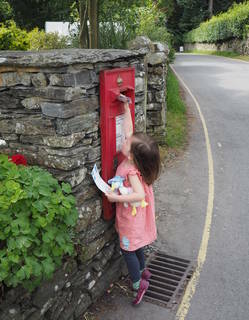 We stayed in Thorney How, a hostel just out of Grasmere, and based on this trip would recommend both the hostel and the village. Grasmere is touristy, but it is only a village and it is off the main road, so it is much quieter than Ambleside or Bowness. And it still has shops and a decent number of attractions in its own right: the church with Wordsworth's grave and a pleasant daffodil garden; Dove Cottage and the Wordsworth Museum; the Faeryland row boat hire (see below); the National Trust property Allan Bank, where Wordsworth lived briefly (we didn't make it to this); assorted shops: mostly outdoor clothing stores and eateries, but also a famous gingerbread shop and a bookshop; and access to some lovely walks (as well as the ones mentioned below, there are a number of walks from nearby White Moss). Thorney How is an easy walk out of Grasmere, but is perfectly placed for short walks up to Easedale Tarn and Helm Crag, or for longer walks continuing further west. It's clean and comfortable and the owners were friendly and helpful without being at all intrusive. Just beware the cat Ptolemy, who climbed into our room through the window twice, the first time while we were out on the first day, the second time in the middle of the night! Our first day was spent doing a circular walk up to Easedale Tarn, probably about 7km (4 miles) starting from our hostel, but over 200+ metres up and then down again, much of it on a rocky and/or boggy track. This is a fantastic walk, with waterfalls, the tarn itself, dramatic crags, stone field walls, and so forth. There were also lots of attractive Herdwick sheep, and Camilla and Helen paddled in the tarn and had little fish nibble their feet. Helen was pretty tired when we got back to our hostel, but only complained towards the end, and she coped really well with clambering over the rocks and using stepping stones across bogs and so forth. Thankfully the nice-looking shoes she had (bought just the day before) turned out to be comfortable and had rubber soles with really good traction on rocks. Our second day was much less strenuous. We wandered around Grasmere in the morning — it was surprisingly quiet, perhaps because the Bank Holiday weekend crowds hadn't arrived yet — and visited the Wordsworth Museum and Dove Cottage, which were really interesting. Helen and Camilla were attracted by the watercolors in the museum, and Helen stayed quite attentive through the cottage tour. And we had lunch there. Then we drove to Beatrix Potter's house at Hill Top, which is a pleasant spot, though we hadn't yet read all the stories so didn't appreciate all the connections. Afterwards we did the walk up to Moss Eccles tarn (or rather I did, Camilla turned back with Helen half way) and then caught the ferry across Windermere. Bowness and Windermere really did seem like tourist disasters, so we drove through and then up into the hills again, up to Kirkstone Pass. There we climbed twenty metres up the hillside and ate dinner. On our third day we went straight to Bowness, to visit the World of Beatrix Potter. Unfortunately the musical that they had running was booked out, but the permanent attraction was a big hit. This has dioramas from the stories, a nice garden, and some interactive displays, and kept both Helen and us entertained for nearly an hour and a half. After that we had lunch, then wandered around Bowness a little. This kind of tourist centre is not my thing at the best of times — I bought some chocolates from a nice little chocolate shop, and had a quick browse of the not very exciting bookshop — but the huge volumes of through traffic in Bowness make it a really unpleasant experience. Unless there's something there you specifically want to see, my advice would be to avoid it. On our last day we stopped in Windermere briefly and got away in the late morning, then had a reasonable run straight down the M6, with a few congested stretches, stopping for lunch at Knutsford services and getting back to Oxford around 5. It all sounds wonderful and seems straight out of our early storybooks. Beautiful photos and good warm weather. Good not to have too many tourists around. Excellent photos and interesting story - it brought back memories of my first visit to the Lake District in the summer of 1959, staying at youth hostels, hiking over many mountains and getting sunburned beside Buttermere. I also remember buying Scott Fitzgerald's `Great Gatsby' and starting reading it, and thoroughly enjoying it, in a beer garden in Grasmere. A visit in 1994 with Vera included some more lovely spots and hikes, including Helvellyn.